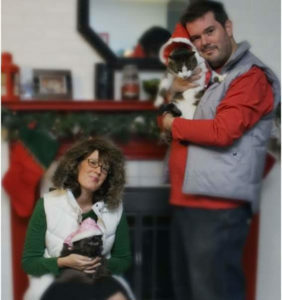 Cross posted but heavily edited from my other site – we had a friend come over the other day, we were attempting to recreate a photo we’d taken nine years ago for a Christmas/Festivus card (below). Nine years ago we had two cats, this year the roles were to be played by kids. Our friend took an epic amount of shots on her Samsung Galaxy 9, but without the professional lighting and her evidently having the makeup effect turned on by default (Samsung,) two nonstop moving kids, there were 180 or so photos taken where nothing quite added up to look perfect. Not her fault, we had to do this with two sugared up kiddos. In any of these photos maybe 3 of us looked fine and one was looking the wrong way. There’s a great one that the littlest one’s face is just blurry, guessing she was moving. A couple the camera’s glamor photo mode was evidently on and on high so the faces were CGI essentially. But, let’s assume you have good portions from a ton of photos, and access to any image editor with a transform tool (both Photoshop and GIMP have these). Find the portions of the good photos you want, grab a frame (I used a polaroid style here) and squeeze your good parts into the frame to make it seem deliberate. Rotate and resize, slap it down, and call that photoshoot a success even though no single photo looked particularly great. For purposes of the example photo below, I grabbed the frame here, and used five images in which portions were great, rotated and transformed things into more or less a decent spot, and in the end feel I got it, more or less. Obviously it’s not professional grade image editing, but it’s something you can quickly and easily do to pull the good bits from a hundred and eighty mostly good photos and it’s extremely simple to do quickly. People at Costco at least thought I was cool. I’ll keep telling myself that. So yeah, photo editor, transform tools, lighting correction, and a free polaroid frame. Bam. More or less. If you don’t have an image editor, you can grab GIMP (the GNU Image Manipulation Program) from here. And I’m sure there are some online tools somewhere else to do the job, feel free to suggest them in the comments. So yeah, just fake it.